In a first of its kind, a sorghum hybrid parents research consortium has been formed in Kenya by the Seed Traders Association of Kenya (STAK) and ICRISAT. The consortium uses a public-private partnership approach to build the seed industry for supply of high performing hybrids to smallholder farmers. ICRISAT was the first international research center under the CGIAR to set up a public-private partnership to develop and improve crop varieties. ICRISAT has run a Hybrid Parents Research Consortium in India since the year 2000. Over time, ICRISAT has set up and managed three hybrid consortia for sorghum, pearl millet and pigeonpea. In these partnerships, members have access to hybrid parents developed by ICRISAT. Sorghum plays an important role as a food security crop especially in semi-arid lands of Kenya. The crop is quite popular in drier areas of Kenya where farmers have few alternative crops that can survive in those conditions. According to the Kenya agricultural sector development strategy (2010-2020), the reason for low productivity of crops such as sorghum is partly because of the low use of improved hybrid seeds due to poor seed distribution systems. Sorghum hybrids are more productive by 15-40% compared to open-pollinated varieties. Collaborations such as this consortium will go a long way to make sure small holder farmers have easier access to the more productive sorghum seeds. “Kenya has a very active seed system with maize as the main crop. However with the devastation caused by Maize Lethal Necrotic Disease (MLND), sorghum is a key alternative food crop” says Dr Evans Sikinyi a senior STAK official. On 25 March, seed companies were invited to the ICRISAT Kiboko Research Facility located in Makindu, for a field day. The companies were exposed to the sorghum hybrid parents developed by ICRISAT which have been tested for adaptability in the dry lowland areas of Kenya. The State Varietal Release Committee (SVRC) of Government of Odisha released its first improved pigeonpea cultivar, ICPH 3762, in the name of Goddess Pārbati. The release of this hybrid has given hope to smallholder pigeonpea farmers in the State to enhance their income and livelihood. According to Dr Myer Mula, Scientist, Seed Systems, ICRISAT three more pigeonpea lines as varieties for Odisha are ready for release by yearend. Possess acceptable dal quality and high milling recovery (>75%). 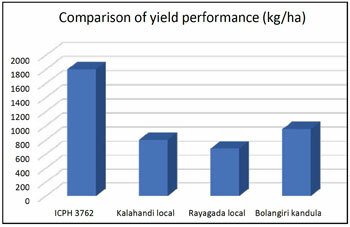 ICPH 3762 recorded 125% increase in yield over local types. This hybrid also possesses complete resistance against wilt and sterility mosaic diseases. It was tested in 72 locations in five major pigeonpea growing districts of Odisha. This work was part of the Tropical Legumes II project funded by the Bill & Melinda Gates Foundation. Funding was also received from Department of Agriculture, Government of Odisha through the Rashtriya Krishi Vikas Yojana (RKVY) project. Pigeonpea is an important rainfed crop in Odisha state cultivated in 150,000 ha. Wilt and sterility mosaic disease are endemic in the state. Until now, the state did not have any improved cultivar (either variety or hybrid) released for cultivation. Farmers cultivated local landraces and varieties available in the market which resulted in low productivity and less income. Dr Bergvinson interacts with partners. In a major boost to ICRISAT’s HarvestPlus-supported pearl millet biofortification breeding program six new partners – three private sector and three public sector – have joined the effort. (See box for list of partners). Private partners will further enhance large-scale seed production and dissemination of biofortified cultivars. Another significant development is that majority of the private sector partners have collectively committed to take up pearl millet biofortification breeding programs. Mr VN Kulkarni, Vice President R&D, JK AgriGenetics, stated that JK Seed Company has instructed its breeders to breed high-iron and high-yielding hybrids with downy mildew resistance. Subsequently breeders have started utilizing high-iron parent from ICRISAT in their crossing programs which have >60 ppm iron content. Also at a recent Scientist Field Day, participants selected 172 biofortified breeding lines and these were supplied to 19 partners. At the Pearl Millet Biofortification Review and Planning meeting which had around half the participants from private sector seed companies, discussions were held around the adoption of ‘Dhanashakti’ by Indian farmers for general cultivation in more than 40,000 ha of land and the commercialization of the first high-iron and high-yielding hybrid – Shakti 1201 (ICMH 1201). 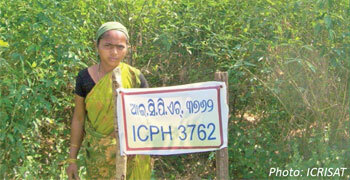 Dhanashakti, developed by ICRISAT, is the first high-iron biofortified cultivar of any crop variety officially released. In line with the Government of India’s Nutri-Farm national pilot program to eradicate micronutrient malnourishment, partners from State Seed Corporations, public and private seed companies and ICRISAT are working towards developing mineral-dense pearl millet cultivars for general cultivation. Dr M Govindaraj, Project Investigator, Pearl Millet Biofortification Breeding, ICRISAT, said the work plan for 2015 includes 23 biofortification field trials and nurseries. Ten trials will be conducted in north India, eight in peninsular India and five in both the zones. 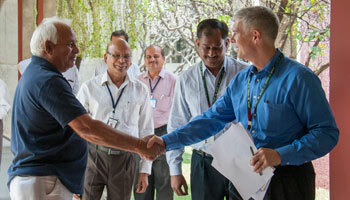 ICRISAT’s biofortification team which developed ‘Dhanashakti’ is expecting to commercialize three more hybrids by 2016. Also, about 10 high-iron hybrids (with >80 ppm Fe) are set for all-India trials. These promising hybrids identified from HarvestPlus trials will be evaluated through All India Coordinated Pearl Millet Improvement Project (AICPMIP) trials in 2015. He congratulated the biofortification team for delivering ’Dhanashakti’ and urged researchers to have immediate business plan for upscaling it. He also urged the group to mainstream iron and zinc as core traits in their breeding program for long-term adoption of biofortified cultivars by farmers and consumers. This project was supported by HarvestPlus Challenge Program of the CGIAR and work is being undertaken as part of the CGIAR Research Program Agriculture for Nutrition and Health (A4NH). The review meeting was held on 23 March at ICRISAT-India. (For more on Dhanashakti, see http://www.icrisat.org/newsroom/latest-news/happenings/happenings1626.htm). Public sector: Prof. Jayashankar Telangana State Agricultural University; Karnataka State Seeds Corporation Ltd; Maharashtra State Seeds Corporation Ltd. I am very happy to know about the global consortium meet to map out strategies to revitalize agricultural education, which is a necessity. ICTs and modern knowledge exchange methodology to train the next generation of agricultural researchers, extension officers and farmers is the need of the hour. One Agriculture-One Science coalition has high expectations to deliver. I am fortunate to take part in the meeting. KSI Head and his team deserve appreciation. District Agricultural Advisory and Transfer of Technology Centre, Vizianagaram.